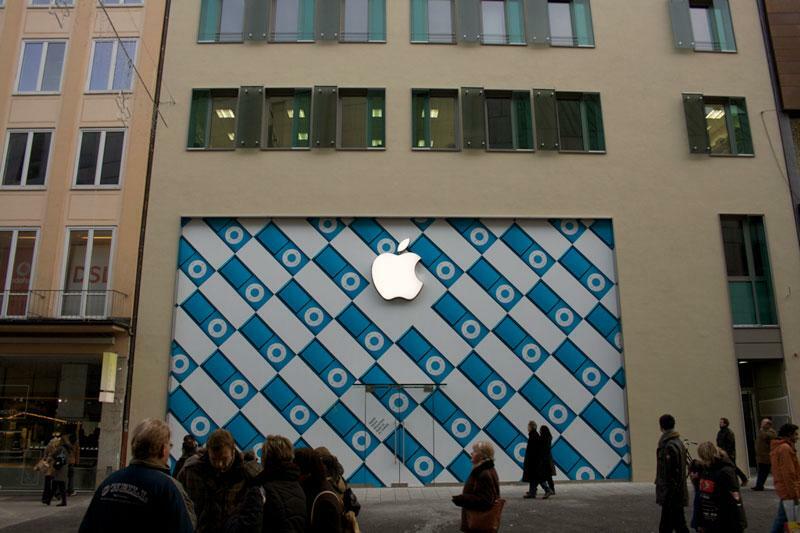 After two years in the making, Apple this weekend will open its first retail store in Germany, a multi-level flagship shop in the heart of Munich. The prized location at 1 Rosenstrasse was home to Sport Schuster sporting goods before Apple took over the lease early last year and then completely razed the existing structure. Although early rumors had Apple building a four-story retail store in its place, it appears the Mac maker has instead constructed a five-story building and will only use the first two floors for sales space. AppleInsider reader Paolo stopped by the store on Sunday and snapped the below photos. A glowing white Apple logo is centered on the second floor glass facade, which remains obscured by a white and blue iPod-patterned protective wrap. The store will hold its grand opening on Saturday at 10:00 a.m. local time. Commemorative t-shirts will be handed out to the first 2500 visitors, according to the shop's official webpage. 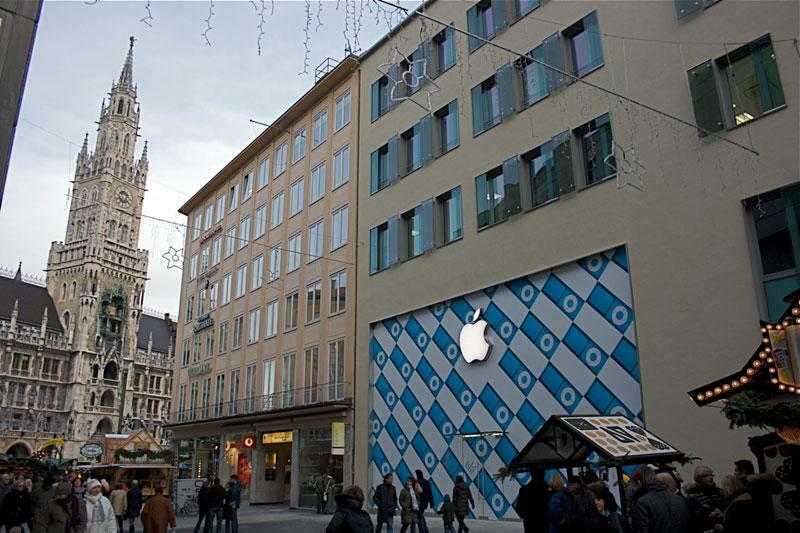 Last year it was reported that the Munich shop would be just one of approximately five Apple retail locations planned for Germany, with other locations expected in Berlin and Frankfurt. There have been few developments in those areas, however, and it's unclear if plans have since changed. The alternating blue and white iPod wrapping symbolizes the colors of the Bavarian State flag. View of central Marienplatz from Rosenstrasse where the new Apple Store will open this Saturday. 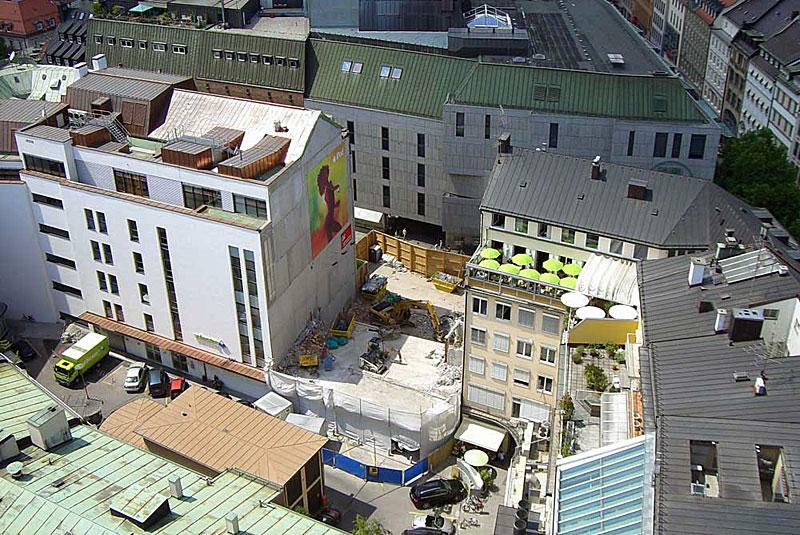 An arial view of Apple's retail space at 1 Rosenstrasse about 18 months ago.